After many trials, I have perfected my all-together-all-you-need-breakfast in a cup! I make them in my ramekins and they are so cute. You can also use breakfast sausage instead of ham. You may want to make them the night before and then cook them in the morning or you can even cook them the night before and then just reheat them in the morning! Preheat oven to 350 degrees. 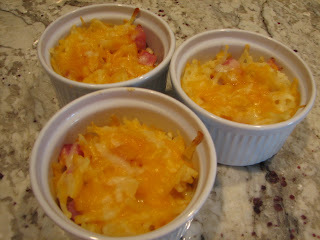 Mix all the ingredients in a bowl, reserving 1/4 cup of cheese. Separate into four ramekins and top with the remaining cheese. You may want to place all the ramekins into a bigger pan so you can transport them easier. Put into the oven and cook for about 25-30 minutes.